There are a lot of truths about me that I am fine with being alone is one of them. I hope those who read this add their own. 1. I am fine with being alone. I like it, need it, cringe without it. Many don’t understand that I don’t need someone there with me on a daily, weekly, or even monthly basis. I particularly don’t need a boyfriend or girlfriend to validate me. 2. I get more accomplished when there is no one around. 3. I like to eat alone because I can read or simply enjoy the food without having to make conversation. 4. I like to go to movies alone. I can hog the drink and popcorn. I can enjoy the movie without someone judging me for what I am watching or what I think about it. 5. I don’t care if people see me alone. I really don’t care what they think. When they try to keep me company because I am alone and must need it it just keeps me from enjoying the activity I am doing. 6. I don’t think a woman alone has a problem, no friends, or is lonely. 7. Please don’t touch me. I don’t like it when you do. It is not that I am inhuman I just don’t want your hand on me. I don’t feel an obligation to put my hand on you. I don’t want to be hugged or comforted I might be alone but I am not lonely. 8. If it looks like I am doing something I probably am, leave me alone. This is a big one for people who interrupt my reading, eating, or working time. 9. I am not lonely. Alone does not equal lonely please don’t assume it does. 10. I am not in the market for a husband, boyfriend, partner, or lover. I do not need someone to complete me I am complete all on my own. These are all things about me that people have mentioned or done. Some of them drive me crazy (like I am not there already). 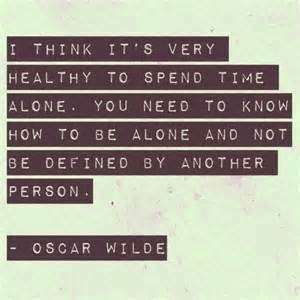 Society tries to dictate what I should feel when I am not with someone and it makes me cringe because it is just not me. Just because I happen to be alone it does not make me lonely. This entry was posted in Fractured, Insanity, Insomnia, Musings, Quiet Insanity and tagged alone, Arts, being alone, Depression, Food, Health, insanity, life, Loneliness, Love, mental-health, Murder, Popcorn, Random Thoughts, Reading, Shopping, Snacks, Solitude, Thought. Bookmark the permalink. I live in a busy house and feel alone.. It is possible to be alone and lonely, alone and not lonely, not alone and not lonely, and worst of all not alone and lonely. I have found that it is better to be alone than it is to be alone in a crowd of people. That can drive you insane. Thank you for your kind words. I am as I believe you are a firm believer in the fact that you have to see yourself as you truly are before you can look at anyone else. There are far too many people who cannot or will not stand on their own. I don’t know if my feet are firmly on the ground. I tend to lose touch with the concrete earth fairly often but I do so enjoy every minute of life even when I am in misery. It reminds me that I am alive and human.